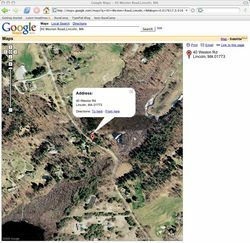 Looking for a satellite view of a property you are considering buying, driving instructions to open house, or need a way to communicate the value of your property’s location to potential buyers? Google’s new mapping program is as easy to use as it is beautiful. Simply beautiful both in presentation and implementation. Screen redraws, at least on my DSL connection, are remarkably fast and users can generate a link to a particular location with a single click. As you can see below, the URL can be quite long, but easily linked to your own web site or marketing flier. Generating driving instructions is just as easy, and the ability to show a satellite view of driving in structions from one point to another — for example a new home to one’s workplace — is quite impressive.